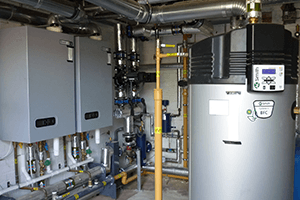 Thorn Grove primary school in Bishops Stortford has replaced it’s old boiler with two Upsilon UB140 gas-fired models from A.O. Smith. At the heart of the Upsilon boilers a stainless steel heat exchanger is designed to provide maximum efficiency with low maintenance costs. The Upsilon is fully modulating for lower gas usage with efficiency levels up to 110% and low carbon emission technology with NOx class 5 rating. Importantly for installations like Thorn Grove, maintenance intervals are only once every 4 years, thereby significantly reducing lifetime costs for the end-user. More information about this Upsilon boiler reference project.